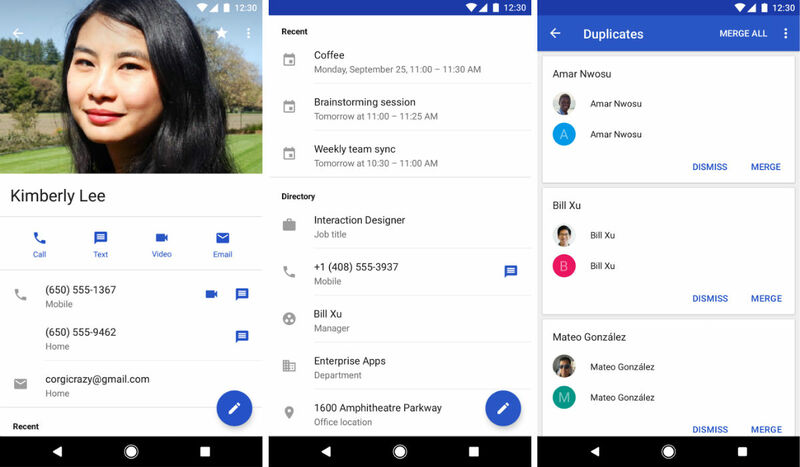 The official Contacts app from Google is receiving an update this week, offering a few UI changes, plus new features that should make connecting with your contacts a quicker experience. For the UI, the app is bringing back big contact photos (a requested feature), action buttons that will be displayed underneath the contact photo (call, text, video, etc. ), plus a Directory Card where you’ll see things like a contact’s job title, work phone number, manager name, and office location. Also new are changes to Suggestions. With the update, you’ll see suggestions to add contacts you frequently communicate with across Google’s various products. To find those, they appear under the “Add people you contact often” summary card. Additionally, the duplicates suggestion view now has a “MERGE ALL” button which allows you to accept all duplicates suggestions at once. Nice. The update is rolling out right now, so have at it.